Atlanta concludes the AFC portion of its schedule in Week six when the Oakland Raiders visit for the first time since 2004. The Raiders finished at an even 8-8 last season, just missing out on a playoff birth. The Raiders were in contention entering the final week of the regular season however, and made major improvements on offense late in the year. Much of the credit goes to Carson Palmer, who performed remarkably well after taking over at quarterback in Week seven, despite being out of football to begin the season. Palmer figures to man the QB spot at least to begin play in 2012, which gives new Head coach Dennis Allen the kind of quarterback stability his predecessors Tom Cable and Hue Jackson never had with JaMarcus Russell, Jason Campbell, Bruce Gradkowski and Charlie Frye, just to name of few recent Raider starters. Palmer and Allen will also have the luxury of a young group of receivers who last season finally began to blossom. There’s no clear cut number one in the group, with Jacoby Ford, Darrius Heyward-Bey and Denarius Moore all fighting for reps, but Heyward-Bey has the best chance to pull to the front of the pack. The former number seven overall draft pick led the Raiders with 64 catches a season ago, and has the best size in the group. Moore meanwhile led the team with five touchdown catches, while Ford showed tremendous promise as a kick returner, averaging over 30 yards a return. With veteran Louis Murphy projecting to be the fourth option, and converted receiver David Ausberry looking like the new starting tight end, one thing Oakland continues to have plenty of is speed. That has been the trend for many years however, and the Raiders haven’t managed a winning season since 2002. Still, Oakland has improved mightily so far in the new decade, and Allen is a nice hire. The Raiders have also had a pretty good summer, bringing in proven pro Ron Bartell to play corner, and also signing defensive compliments Pat Lee and Dave Tollefson. Lee is a speedy defensive back who plays anywhere on special teams and can disguise himself well on both corner and safety blitzes, and Tollefson won two Super Bowls with the Giants. He joins former Colt Philip Wheeler as Oakland’s other free agent linebacker signee. 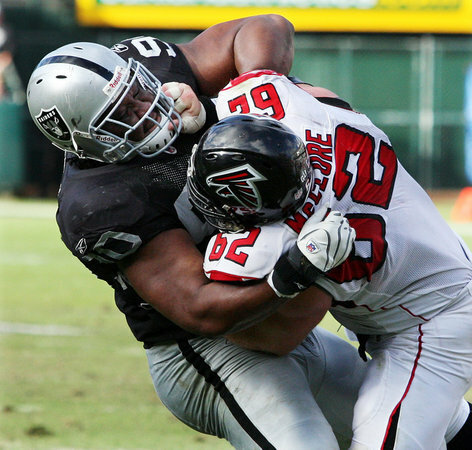 The Raiders should contend again this year, and could very well crack the AFC’s top six. That said, they shouldn’t be favored over Atlanta, especially on the road. The Falcons should be able to use the run game to play to a preferred tempo, and can exploit Oakland’s secondary with play action. Though Oakland’s speed is a concern, the Falcons remain the better overall football team. Week 8: @ Philadelphia Eagles. Its take two for the Dream Team, and after a frustrating 2011 campaign in which they went an unremarkable 8-8, the Eagles are banking on a division title in 2012. Even though the other three members of the NFC East should make things challenging for the Eagles, on paper they’re on of the most talented team in the NFC, in the same discussion as the Packers, Lions and 49ers. Former Falcon Mike Vick has done more than enough to prove he’s deserving of the Eagle’s starting QB position, and if healthy he can still be one of the most dangerous individual players in the game. With DeSean Jackson, LeSean McCoy, Nnamdi Asomugha still in the fold, the Philadelphia has the star power to make a deep playoff run. Unfortunately, the Eagles’ most obvious problem a season ago, team chemistry, was a big one. That remains Philadelphia’s biggest concern heading into training camp. When the Eagles traveled to Atlanta last season, the Falcons 35-31 come from behind victory was thought to be a major upset. That was in Week 2, and the Eagles were coming off a dominant road performance against the Rams in St. Louis, while the Falcons had stumbled in their opening game, losing by three scores to the Chicago Bears. Matt Ryan and Mike Vick combined to throw six touchdown passes in that game, though Vick, in his return to Atlanta, was forced to exit the game late in the third quarter with a concussion. While it’s hard to imagine the same number of storylines playing out this time around, a tight, high-scoring game should once again be expected. Both teams feature potent offenses, and actually resemble one another quite a bit at receiver. Head to head, Philadelphia’s Jackson, Jeremy Maclin and Jason Avant match up well with Atlanta’s White Jones and Harry Douglas, so it’s difficult to foresee one group significantly outdoing the other. Despite only a .500 record a year ago, the Eagles defense actually finished in the top half of teams in most major defensive categories, including points allowed per game and also rush and pass yards allowed per game. Defensive Coordinator Juan Castillo faced boatloads of criticism in Philadelphia in his first season despite that however, although it’s important to remember he does in fact coach in Philadelphia, a city whose fans boo in their sleep. This year, Castillo and the Eagles welcome in new defensive backs coach Todd Bowles, hoping the former Miami Dolphins interim Head coach can further improve a secondary that last season made John Skelton and Tavaris Jackson look the part of All-Pros. Bowles inherits a group led by Nnamdi Asomugha, whose meek three interception total last year really only reflects how little opposing quarterbacks throw to his side of the field. The key for the Eagles not only against the Falcons in week eight, but for the entirety of the season is their run defense. The Eagles made themselves huge draft day winners when they traded up to select Mississippi State’s Fletcher Cox at 12 overall, and continued to address run defense with their two second round picks, linebacker Mychal Kendricks and defensive end Vinny Curry. Defending the run was the most glaring on-field weakness for the Eagles a year ago, and Cox in particular is being brought in to do that right away. Though the Eagles will continue to live and die on offense, if they can solidify things on the other side of the ball, there really isn’t any reason to project them to finish worse than 10-6. They are also one of only a couple teams Atlanta will play this year that may out-talent the Falcons. Look for this season’s meeting to once again feature the Vick – Ryan match-up, as well as the Asomugha – Asante Samuel match-up, as Samuel comes to Atlanta after a down year with the Eagles. Week 9: Vs. Dallas Cowboys. Though the Dallas Cowboys haven’t done anything overly surprising so far this summer, like most teams that feel they are on the cusp of seriously contending, the Cowboys have filled out their roster with complimentary parts that fit the mold Jerry created. Guard Mackenzy Bernadeau, fullback Lawrence Vickers and quarterback Kyle Orton were all brought in within 10 ten hours of one another in March, and while they don’t figure to alter the direction of the Cowboys, their arrivals do suggest Jones and Head coach Jason Garrett see the 2012 Cowboys as winners right now. The problem of course is that the Cowboys play in the NFC East, football’s toughest division. Based upon their schedule alone, Dallas looks as if it will need to go at least 10-6 to be in the discussion for a playoff spot, and will likely have to be even better than that to keep up with the Eagles and Giants, neither of whom appear to be going away anytime soon. While we’ve seen three teams from one division make the playoffs before, (the AFC North brought three teams to the postseason last year) the Cowboys have so little room for error that I have a hard time putting them in the playoffs right now. Back-to-back road games at the Meadowlands and Seattle to begin the year sure makes it look as if the Cowboys will need to be near-perfect in their non-division games. This week nine game in Atlanta is actually one of the more winnable road games on the Cowboy’s schedule, which also takes them to Carolina and Baltimore. That doesn’t bode well for the Cowboys, who could very well lose three or four of those road games and be playing catch-up in the standings entering play on Thanksgiving. On the other hand, should luck be with the Cowboys rather than against them, Dallas could just as easily win three or four of those road games and enter December in the thick of things in their division. Like the Washington Redskins, much of Dallas’ season banks on things such as health and overall good fortune. While that may not be how Jerry Jones chooses to look at his team, even he must recognize the difficult task at hand. Particularly for a club that missed the playoffs largely because of a late-season loss to Arizona last year. As far as the match-up with the Falcons goes, Tony Romo and Matt Ryan threw for virtually identical totals last season, with Romo throwing for seven more yards and two more scores than Ryan. That doesn’t project to change a whole lot, even though the two QBs don’t possess all the same strengths and weaknesses. Neither team’s offense has changed all that much at the skill positions from last year to this year, with the one possible exception being receiver Laurent Robinson’s leaving Dallas for Jacksonville. Like the Eagles, the Cowboys moved up in the draft to take can’t-miss cornerback Morris Claiborne from LSU, hoping he could become the playmaker in their secondary. That should happen eventually, but not without some growing pains. Claiborne thrived at LSU when he played alongside fellow 2012 draftee Ron Brooks, (Buffalo Bills, pick 124) and doesn’t appear to have that same type of luxury in Dallas. The Cowboys did go out and sign free agent Brandon Carr, but Carr is hardly the unsung complimentary player Brooks was at LSU. Given how much the Cowboys figure to be relying on Claiborne this year, it would make sense to provide the rookie with all the tools he both needs and wants to excel. It is quite possible Matt Ryan and the Falcons are the team to make that apparent to the Cowboys in week nine.